The biodegradation of hydrocarbons in crude oil under saline stress needs to be investigated because degradation was generally lack or slow, whereas crude oil or petroleum hydrocarbons are major pollutants of marine environments. A natural isolate, Fusarium sp. F092, having the ability to degrade chrysene was used to degrade the aliphatic fraction in crude oil contaminating a liquid culture with artificial sea water (35). Three types of crude oil were used to perform these experiments. F092 showed the best performance to break down the aliphatic fraction in crude oil type-3 (98%) and type-2 (72%) and type-1 (49%) after 60 days with an initial concentration of 1000 mg L-1. Furthermore, almost all the aliphatic compounds (Up to C31) in the crude oil were degraded by F092 which preferred short and long chain hydrocarbons. Incubation with 15000 mg L-1 degraded less than 40% of the aliphatic fraction of all crude oils tested. The outstanding ability of Fusarium sp. F092 to adapt to artificial sea water and degrade the aliphatic fraction of all crude oils at high concentrations offers an alternative for bioremediation of crude oil-polluted marine environments. Crude oil or petroleum hydrocarbons are major pollutants of marine environments released as a result of offshore drilling, well accidents, transportation accidents, ruptured pipelines, routine washing of storage tankers and natural oil seepage (Harayama et al., 1999; Kvenvolden and Cooper, 2003; Chaineau et al., 2005; Minai-Tehrani et al., 2006a; Elshafie et al., 2007; Hasanuzzaman et al., 2007). Bioremediation involves treating the petroleum pollutants with aliphatic-degrading microorganisms possessing many kinds of enzymes. It has been shown to be a viable, relatively low cost, low-technology technique, break down the pollutants in a shorter time and its use is widespread (Bogan and Lamar, 1996; Kang and Oulman, 1996; Vidali, 2001; Erdogan and Karaca, 2011). Crude oil contains a large variety of compounds mainly consisting of carbon and hydrogen. They are generally categorized into four fractions based on their solubility in organic solvents: aliphatics, aromatics, asphaltenes and resins (Atlas, 1985; Harayama et al., 1999; Venosa and Zhu, 2003; Prince and Walters, 2007). The aliphatic fraction is the largest component in fossil fuels and its biodegradation has been considered useful for enhancing oil recovery (Binazadeh et al., 2009). Many microorganisms (bacteria, fungi and yeast) are known to grow and utilize hydrocarbons in crude oil and derived products (Cerniglia, 1992; Juhasz and Naidu, 2000; Thavasi et al., 2007; Yemashova et al., 2007; Sarma and Sarma, 2010; Das and Chandran, 2011). Although, aliphatic hydrocarbons are easily biodegraded, long chain and branched-chain hydrocarbons are not (Hasanuzzaman et al., 2007). Furthermore, microorganisms capable of degrading aliphatic hydrocarbons in crude oil under hypersaline conditions have been more difficult to obtain because the degradation rate decreases with increasing salinity in the range 3.3-28.4% and with increasing pH (Venosa and Zhu, 2003). Recently, many studies have focused on hydrocarbon degradation under saline conditions with bacteria but not fungi. In particular, Fusarium sp. F092 that was isolated based on the ability to metabolize chrysene under saline condition (Hidayat et al., 2010). This method has been proposed as an efficient way of identifying fungi can degrade crude oil because chrysene is a Polycyclic Aromatic Hydrocarbon (PAH), a poorly degradable group contained in crude oil. No Fusarium species able to degrade crude oil have been studied until now. Therefore, the aim of this study was to asses Fusarium sp. F092 for its ability to degrade the aliphatic fraction in three types of crude oil with artificial sea water in liquid cultures. Chemicals: Types 1 and 2 crude oil were obtained from Taiyo Petroleum Co. Ltd (Japan). Type 3 was collected from sea water polluted by an oil spill (Hiroshima, Japan). Agar, glucose, C-200 silica gel, CaCl2, Hexadecane (C16H34) and other chemicals were purchased from Wako. Co. Ltd (Japan). Pentadecane (C15H32) was purchased from TCI. Co. Ltd (Japan). The material for synthetic sea water was obtained from Delphis (Japan). Biodegradation assay: The liquid culture experiments were conducted in 100 mL erlenmeyer flasks containing 20 mL of Potato Glucose Medium (PGM) with artificial sea water (35 g L-1) used to make saline conditions. A fixed concentration of crude oil type-1, type-2, or type-3 dissolved with n-hexane was added to the culture. The culture was stood overnight on a clean bench for evaporation of the solvent. Then, 3 agar plugs (5-mm in diameter) punched out from an actively growing Fusarium sp. F092 were inoculated. The culture was incubated at 25°C. The degradation of crude oil was determined at 15, 30 and 60 days. The effect of the type (1, 2 or 3) and concentration (1000 and 15000 mg L-1) of the crude oil on aliphatic degradation was studied. A negative control was also prepared to confirm the loss of crude oils during incubation and quantification and was carried out in erlenmeyer flasks with 20 mL of PGM containing substrates without inoculated fungi. Analyses of the aliphatic fraction of crude oil: Hydrocarbon concentrations were determined by extraction and purification using several solvents basically as described by Chaineau et al. (2005). Briefly, the culture was extracted three times using n-hexane, dichloromethane (CH2Cl2) and chloroform (CHCl3) (100 mL each). N-hexane was used to separate the fractions. The n-hexane-insoluble fraction consisted of asphaltenes and some organic compounds. The n-hexane-soluble fraction was separated further into aliphatic, aromatic and Nitrogen-Sulfur-Oxygen (NSO) fractions by chromatography on a column filled with 5g of C-200 silica gel eluted with 100 mL of n-hexane, 100 mL of toluene and finally 200 mL of a combination CHCl3 and methanol (ratio 1 : 1) (v/v). T he aliphatic fraction was analyzed by gas chromatography (GC Shimazdzu G-3000 for crude oil type-1 and GC Shimazu 2014 for crude oil type-2 and type-3), with a TC-5 capillary column (length : 30 m, i.d : 0.24 mm). The carrier gas was Helium delivered at a constant flow rate of 1.5 mL min-1 with a column pressure of 100 Kpa and interface temperature of 280°C. The temperature program was started at 60°C, increased at 10°C min-1 to 280°C and maintained at 280°C for 10-20 min to allow late eluting peaks to exit the column. The injection volume was 2 μL and the injector temperature was maintained at 280°C. Aliphatic compounds of crude oil were analyzed using the kovats retention index system (Jennings and Shibamoto, 1980). Enzymes assay: Extra-cellular and intra-cellular enzyme production was investigated in potato glucose medium. The enzymatic activity was observed every 10 until 40 days incubation. The culture was homogenized at 10000 rpm for 10 min. The enzymatic activities in the crude supernatant were investigated spectrophotometrically using a Shimadzu UV-1600. Manganese peroxidase activity was assayed with methods described by Wariishi et al. (1992). Laccase activity was assayed as described by Leonowcz and Grzywnowicz (1981). 1,2-Dioxygenase activity was assayed as described by Nakazawa and Atsushi (1970). 2,3-Dioxygenase activity was assayed with the method described by Nozaki (1970). All experiments were carried out at 25°C. Activities were expressed as international units per liter of enzyme, where one unit of activity is defined as the amount of enzyme necessary to convert 1 μmol of substrate in 1 min. Data analyses: All results are presented as means of triplicates±standard deviations. Data was analyzed for significant differences between treatments using a one-way analysis of variance (ANOVA). To establish whether differences (p<0.05) between individual treatments were significant, the Duncan multiple range test was applied. All analyses were conducted using SPSS version 15 for windows. Degradation of aliphatic fraction of crude oil: In this study, three types of crude oil were used. The composition of aliphatic, aromatic, NSO and hexane insoluble fractions including asphaltene and organic compounds was determined (Table 1). The aliphatic fraction was large in crude oil type-3 (75.4±5.5) than crude oil type-1 or type-2 and the other fractions comprised less than 31% of the total. N-hexane, dichloromethane and chloroform were used to extract crude oil and determine Total Petroleum Hydrocarbons (TPH) as shown in the material and methods. The level of TPH in liquid medium was 1000 and 15000 mg L-1 at the beginning of the incubation and changed little during incubation in the control system or abiotic system. 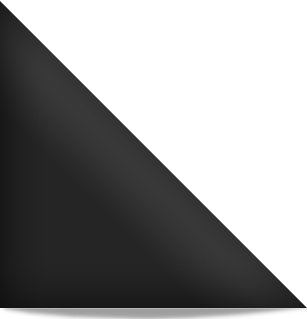 The degradation of the aliphatic fraction of the three types of crude oil is shown in Fig. 1. At 1000 mg L-1, Fusarium sp. F092 degraded 98, 72 and 49% of the aliphatic fraction of crude oil type-3, type-2 and type-1, respectively. The difference was significant (p<0.05). At 15000 mg L-1, F092 degraded less than 40% of the aliphatic fraction (Fig. 1). The increase in initial oil concentration decreased significantly (p<0.05) the degradation amount of aliphatic fraction in all types of crude oil. Degradation of individual aliphatic fractions: Figure 5 and 6 show GC chromatograms of the aliphatic fraction in crude oil (1000 mg L-1) before and after degradation. 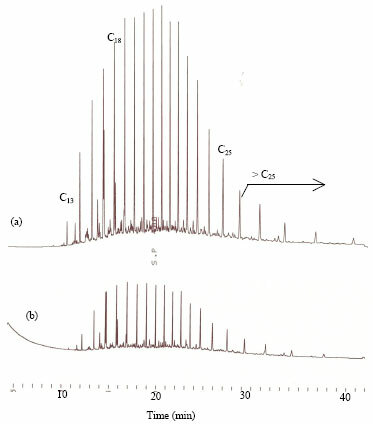 The peaks of all aliphatic compounds are clearly distinguishable in the GC chromatogram and the compounds were determined using the Kovats Index (KI). Crude oil type-1, 2 and 3 contained C13 to C31, C13 to C27 and C12 to C20, respectively. All crude oil types were composed of linear aliphatic hydrocarbons and branched and cyclic aliphatic hydrocarbons. Carbon numbers of less than 10 are usually lost during the incubation due to evaporation. To make sure of the amount due to evaporation, it was investigated which the result shown that percentage of all aliphatic compounds consisted in three types of crude oil during incubation were not changes. Furthermore, the degradation of the aliphatic fraction of crude oil type-3 by Fusarium sp. F092 was greater than that of crude oil type-1 and type-2. Almost all the aliphatic compounds (Up to C13) were degraded. The degradation of aliphatic fraction was done significantly in short and long carbon number, as shown in Fig. 5 and 6. The degradation of each compound of aliphatic fraction was shown clearly in Fig. 2, 3 and 4 which gave the percentage degradation after 15, 30 and 60 days. Thus, Fusarium sp. F092 prefers short and long carbon numbers compounds during degradation of crude oil (Fig. 5, 6) and metabolite degradation product, but remained in middle carbon numbers compounds. Enzymatic activity: Ligninolytic and non ligninolytic enzymatic activities were investigated in liquid cultures. The variation of activity and function with the incubation of Fusarium sp. F092 is shown in Fig. 7. The activity level of manganese peroxidase and laccase reached 69.2 and 48.8 UL-1 on 20 days, while 1,2-and 2,3-dioxygenase showed the highest level after 20 days (289.5 and 49.7 U L-1), respectively. Specifically for the degradation, 1.2-and 2.3-dioxygenase enzymes would attack an aromatic compound at the 1.2- and 2.3-position. In the present study, Fusarium sp. F092 was able to degrade aliphatic fraction of three type crude oil under saline condition. This result was important because biodegradation by microorganisms under saline conditions was generally lacking or slow. There was a major impact on cell growth through 1) disruption to the cell membrane, 2) the denaturing of some proteins and 3) change in osmotic pressure and any of which could be lethal (Woolard and Irvine, 1994; Kargi and Dincer, 2000). The degradation of the aliphatic fraction decreased significantly (p<0.05) as the concentration of crude oil in the culture increased. These results are consistent with previous report, the increase in the initial oil concentration decreased the degradation (Adenipekun and Isikhuemhen, 2008; Binazadeh et al., 2009). This result indicated that increasing in oil concentration might increase the level of compounds, toxicity and nutrient or oxygen limitation. Finally, their ability changed due to inhibit effect on the enzymatic degradation. Furthermore, type-3 crude oil was more easily degraded than type-1 or type-2. The aliphatic fraction in type-3 crude oil consisting of C12 to C20 was considered the most rapidly degradable components (98%) than in crude oil type-1 (C13-C27) and type-3 (C13-C31). The increase carbon number of the aliphatic fraction in crude oil is considered hardly degradable substrates, n-alkanes in C8 to C15 range are attacked first and next the isoprenoid-to-alkane ratio increases as the >C15+ n-alkanes are attacked (Wenger et al., 2002). The degradation of aliphatic compounds has generally been ranked in the following order of decreasing susceptibility: n-alkanes > branched alkanes > cyclic alkanes (Leahy and Colwell, 1990; Wenger et al., 2002; Chaineau et al., 2005; Prince and Walters, 2007). Fusarium sp. F092 was considered to degrade easily aliphatic fraction in crude oil >50% and consist a carbon number of less than 20 (crude oil type-3). The degradation was moderate if the aliphatic fraction in crude oil < 50% containing a carbon number of less than 27 (crude oil type-2). It was difficult if the aliphatic fraction in crude oil > 50% and containing a carbon number of more than 27 (crude oil type-1). The degradation of hydrocarbon pollutants also depends on the composition of oil (Jain et al., 2011; Yemashova et al., 2007; Yang et al., 2009), ability of microorganisms (Prince and Walters, 2007; Yang et al., 2009), viscosity (Amund and Adebiyi, 1991) and environmental factors (Ateef et al., 1999; Minai-Tehrani et al., 2006b; Yemashova et al., 2007; Prince and Walters, 2007; Yang et al., 2009). Fungi metabolize crude oils, converting them to carbon dioxide or into secondary metabolites. This may generate products of metabolism with worse physical and chemical properties than the oil itself. The enzymatic systems produced by fungi are keys to converting crude oil. Fusarium sp. F092 produced extra and intra-cellular enzymes, especially in liquid medium. The extra-cellular lignolytic system consists of three main enzyme groups with lignin peroxidase (LiP), Manganese Peroxidase (MnP), phenol oxidases (Lacases, tyrosinases) and H2O2-producing enzymes (Haritash and Kaushik, 2009). MnP oxidizes Mn (II) to form Mn (III) and then Mn (III) oxidizes a phenolic substrate to produce phenoxy radicals with hydrogen peroxide (H2O2). Laccases are multi copper enzymes catalyzing the oxidation of a variety of phenol compounds which involves the reduction of O2 to H2O. These polyphenol oxidases are widely distributed among fungal species. The intra-cellular system metabolizes pollutants through cytochrome P450 monooxygenase and epoxide hydrolase-catalyzed reactions to form trans-dihydrodiol via arene oxide. Aliphatic compounds, a major group in crude oil, are rapidly degraded by Fusarium sp. F092 and closely related to enzyme activities produced. In most cases, aerobic biodegradation of aliphatic hydrocarbon begins with addition of one or both atoms of diatomic oxygen by enzymes known as monooxygenases or dioxygenases (Prince and Walters, 2007) and then oxidation of extraterminal methyl groups to primary alcohol and aldehydes (Atlas, 1981; Yemashova et al., 2007). The aliphatic hydrocarbon could be oxidized to fatty acid and take out them via fatty acid metabolisms in cellular lipids (Hadibarata et al., 2007). The aliphatic fraction is the largest component of fossil fuels and its biodegradation has been considered a useful tool for enhancing oil recovery (Binazadeh et al., 2009). The results obtained in this study clearly demonstrated that Fusarium sp. F092 could degrade the aliphatic fraction in crude oil under saline conditions. This ability offers an alternative for the bioremediation of crude oil-polluted marine environments. This research was partly supported by KAKENHI - Japan (23580230). We thank our colleagues for support and help in conducting this research and also for critical reading of the manuscript. Adenipekun, C.O. and O.S. Isikhuemhen, 2008. Bioremediation of engine oil polluted soil by the tropical white rot fungus, Lentinus squarrosulus Mont. (Singer). Pak. J. Biol. Sci., 11: 1634-1637. Amund, O.O. and A.G. Adebiyi, 1991. Effect of viscosity on the biodegradability of automotive lubricating oils. Tribol. Int., 24: 235-237. Ateef, N.M., N.M. Morsi and M.E.S. Mohamed, 1999. Crude oil biodegradation by naturally inhabiting mixed bacterial culture under different environmental factors. Pak. J. Biol. Sci., 2: 1211-1218. Atlas, R.M., 1981. Microbial degradation of petroleum hydrocarbons: An environmental perspective. Microbiol. Rev., 45: 180-209. Atlas, R.M., 1995. Petroleum biodegradation and oil spill bioremediation. Mar. Pollut. Bull., 31: 178-182. Binazadeh, M., I.A. Karimi and L. Zhi, 2009. Fast biodegradation of long chain n-alkanes and crude oil at high concentrations with Rhodococcus sp. Moj-3449. Enzyme. Microb. Technol., 45: 195-202. Bogan, B.W. and R.T. Lamar, 1996. Polycyclic aromatic hydrocarbon-degrading capabilities of Phanerochaete laevis HHB-1625 and its extracellular ligninolytic enzymes. Applied Environ. Microbiol., 62: 1597-1603. Cerniglia, C.E., 1992. Biodegradation of polycyclic aromatic hydrocarbons. Biodegradation, 3: 351-368. Chaineau, C.H., G. Rougeux, C. Yepremian and J. Oudot, 2005. Effect of nutrient concentration on biodegradation of crude oil and associated microbial populations in the soil. Soil Biol. Biochem., 37: 1490-1499. Elshafie, A., A.Y. Alkindi, S. Al-Busaidi, C. Bakheit and S.N. Albahry, 2007. Biodegradation of crude oil and n-alkanes by fungi isolated from Oman. Mar. Pollut. Bull., 54: 1692-1696. Erdogan, E.E. and A. Karaca, 2011. Bioremediation of crude oil polluted soils. Asian J. Biotechnol., 3: 206-213. Hadibarata, T., S. Tachibana and K. Itoh, 2007. Biodegradation of n-eicosane by fungi screened from nature. Pak. J. Biol. Sci., 10: 1804-1810. Harayama, S., H. Kishira, Y. Kasai and K. Shutsubo, 1999. Petroleum Biodegradation in Marine Environments. J. Mol. Microbiol. Biotechnol., 1: 63-70. Haritash, A.K. and C.P. Kaushik, 2009. Bioremediation aspect of polycyclic aromatic hydrocarbon (PAHs). J. Hazard. Mater., 169: 1-15. Hasanuzzaman, M., A. Ueno, H. Ito, Y. Ito, Y. Yamamoto, I. Yumoto and H. Okuyama, 2007. Degradation of long-chain n-alkanes (C36 and C40) by Pseudomonas aeruginosa strain WatG. Int. Biodeterior. Biodegrad., 59: 40-43. Hidayat, A., K. Itoh and S. Tachibana, 2010. Degradation of chrysene under saline condition by Fusarium sp. F092. Proceedings of 60th Annual Meeting of the Japan Wood Research Society, (AMJWRS’10), Miyazaki, pp: 67-67. Jain, P.K., V.K. Gupta, R.K. Gaur, M. Lowry, D.P. Jaroli and U.K. Chauhan, 2011. Bioremediation of petroleum oil contaminated soil and water. Res. J. Environ. Toxicol., 5: 1-26. Jennings, W. and T. Shibamoto, 1980. Qualitative Analysis of Flavor and Fragrance Volatiles by Glass Capillary Column Gas Chromatography. 1st Edn., Academic Press, New York, USA. Juhasz, A.L. and R. Naidu, 2000. Bioremediation of high molecular weight polycyclic aromatic hydrocarbons: A review of the microbial degradation of benzo[a]pyrene. Int. Biodeterior. Biodegrad., 45: 57-88. Kang, S.H. and C.S. Oulman, 1996. Evaporation of petroleum products from contaminated soils. J. Environ. Eng., 122: 384-387. Kargi, F. and A.R. Dincer, 2000. Use of halophilic bacteria in biological treatment of saline wastewater by fed-batch operation. Water Environ., 72: 170-174. Kvenvolden, K.A. and C.K. Cooper, 2003. Natural seepage of crude oil into the marine environment. Geo-Mar. Lett., 23: 140-146. Leahy, J.G. and R.R. Colwell, 1990. Microbial degradation of hydrocarbons in the environment. Microbiol. Mol. Biol. Rev., 54: 305-315. Leonowcz, A. and K. Grzywnowicz, 1981. Quantitative estimation of laccase forms in some white-rot fungi using syringaldazine as a substrate. Enzyme Microb. Technol., 3: 55-58. Minai-Tehrani, D., A. Herfatmanesh, F. Azari-Dehkordi and S. Minooi, 2006. Effect of salinity on biodegradation of aliphatic fractions of crude oil in soil. Pak. J. Biol. Sci., 9: 1531-1535. Minai-Tehrani, D., S. Minooi, F. Azari-Dehkordi and A. Herfatmanesh, 2006. The effect of triton X-100 on biodegradation of aliphatic and aromatic fractions of crude oil in soil. J. Applied Sci., 6: 1756-1761. Nakazawa, T. and N. Atsushi, 1970. Pyrocatechase (Pseudomonas). Methods Enzymol., 17: 518-522. Nozaki, M., 1970. Metapyrocatechase (Pseudomonas). Methods Enzymol., 17: 522-525. Prince, R.C. and C.C. Walters, 2007. Biodegradation of Oil Hydrocarbons and its Implications for Source Identification. In: Oil Spill Environmental Forensics, Wang, Z. and S.A. Stout (Eds.). Academic Press Publication, California, USA., pp: 349-403. Sarma, A. and H. Sarma, 2010. Enhanced biodegradation of oil products by some microbial isolate supplemented with heavy metals. Int. J. Bot., 6: 441-448. Thavasi, R., S. Jayalakshmi, R. Radhakrishnan and T. Balasubramanian, 2007. Plasmid incidence in four species of hydrocarbonoclastic bacteria isolated from oil polluted marine environment. Biotechnology, 6: 349-352. Venosa, A.D. and X. Zhu, 2003. Biodegradation of crude oil contaminating marine shorelines and freshwater wetlands. Spill Sci. Technol. Bull., 82: 163-178. Vidali, M., 2001. Bioremediation: An overview. Pure Applied Chem., 73: 1163-1172. Wariishi, H., K. Valli and M.H. Gold, 1992. Manganese(II) oxidation by manganese peroxidase from the basidiomycete Phanerochaete chrysosporium. Kinetic mechanism and role of chelators. J. Biol. Chem., 267: 23688-23695. Wenger, L.M., C.L. Davis and G.H. Isaken, 2002. Multi control on petroleum biodegradation and impact on oil quality. SPE Reserv. Eval. Eng., 5: 375-383. Woolard, C.R. and R.L. Irvine, 1994. Biological treatment of hypersaline wastewater by biofilm of halophilic bacteria. Water Environ. Res., 66: 230-235. Yang, S.Z., H.J. Jin, Z. Wei, R.X. He, Y.J. Ji, X.M. Li and S.P. Yu, 2009. Bioremediation of oil spill in cold environments: A review. Pedosphere, 19: 371-381. Yemashova, N.A., V.P. Murygina, D.V. Zhukov, A.A. Zakharyantz, M.A. Gladchenko, V. Appanna and S.V. Kalyuzhnyi, 2007. Biodeterioration of crude oil and oil derived products: A review. Rev. Environ. Sci. Biotechnol., 6: 315-337.